There’s a new older poem in the latest double issue of Artful Dodge, the magazine from the Department of English at The College of Wooster, in Ohio. Find all the details right here! Reading at Verbatim Books on 12/21! I’m reading with Alexandra Mattraw in San Diego! Hope to see you out at Verbatim Books at 30th and North Park Way in San Diego on 12/21 at 8pm! 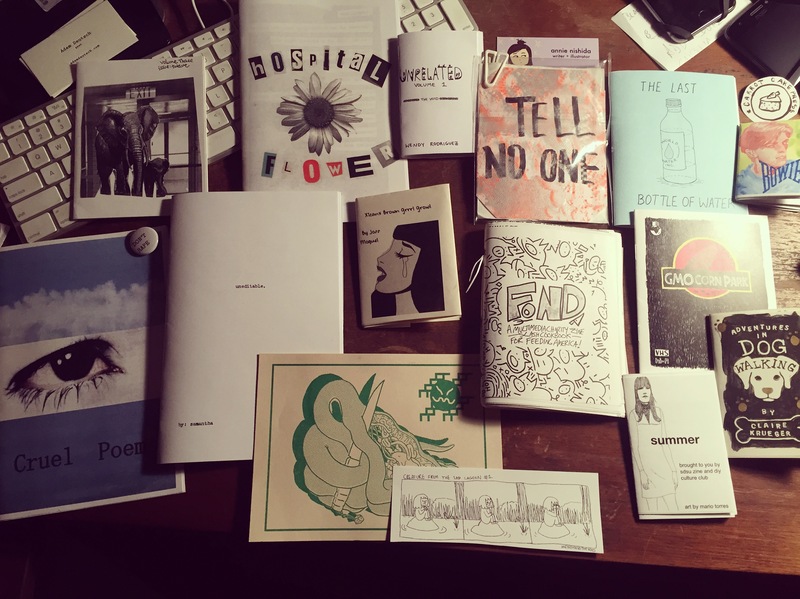 In the picture are artifacts from Jillian Sandell, modempunk.com, Jennsteffey.com, clairekrueger.com, the SDSU Zine Club, https://thegiantrat.carrd.co/, wendyandthevoid.com, jaylilliane.com, thekidandi.bandcamp.com, and a few others who are a bit more elusive. You might find their stuff at Verbatim Books in San Diego, but check out their work if you’re into the zine-arts! See you at the San Diego Festival of Books! I’ll be at the San Diego Festival of Books on 8/25 at noon, with the wonderful local powerhouse, Verbatim Books. Check them out all day, hosting local authors hour for hour. Click here for their facebook event. If you’ve been a fan of digital chapbooks that were housed for free on press websites, but then found those presses to have disappeared, you know just how delicate some areas of our poetry ecosystem are, and what they simply cannot handle. I used to have a chap that went away, but now it’s back again. I hope you enjoy Carry On, a collection of elegies. You can find it, along with other zine projects in the Chap/Zine part of this site. Carry On is also available wherever you like to pick up books of poems. If you’re in Indianapolis, LA, NYC, or SD, I’d love to see you at one of these readings! April 28th, 2018: Group reading at Vermin on the Mount, La Bodega, Barrio Logan, San Diego, CA! There’s a new issue of pacificREVIEW out of SDSU, and I have a poem in there called “Hammer,” side by side with work by Jim Ruland, Kazim Ali, Hanna Tawater, and Michelle Bonczek Evory. It’s also on the amazon. The editor of this Errant Mythologies issue was Hari Alluri, a poet I missing having in the San Diego community. I know you love stories, poems, and essays, but how do you feel about a game of 8-ball? How about literature racked up and ready to break? Sean Thomas Dougherty has curated a new collection called Double Kiss: Stories, Poems, & Essays on the Art of Billiards, and included a poem of mine there in. You can find more details over at Mammoth Books, and if you want to find the poem, you’ll have to go through the joyous task of digging through the wonderland of the old No Tell Motel archive…wherein there is much magic…. I hope you enjoy the Vol. 2 No.1 issue of AMP Magazine, a project out of Hofstra University, and a poem called “Traffic in Indie Circles.” Though a resistant student who aggressively refused to try to understand Ashbery’s Chinese Whisper (if I recall my presentation was “Here are some poems. You figure it out”), Janet Kaplan is a wonderful professor, a powerful writer, and I’m humbled this poem caught her editor’s eye. It’s for two students who were in my first workshop at the University of Illinois, excellent writers who seem to run on the same Chicago scene, and they sent a photo one day that was overwhelming joyful, and this poem overflowed from that. Moonsick Magazine, a journal promoting women, queer, and non-binary voices, is a publication doing what it clearly means to do: challenge the traditional literary canon of cisgendered white men. The editor’s note is right here. It’s one of those journals that I’m positive cisgendered white men send to all the time, even when the guidelines specifically make it clear which voices the journal is calling for. But they also have an annual DUDE issue, and you’ll find “Leave No Trace” in that one. It’s humbling to have work welcomed into this space, and I hope you enjoy it, but also hope you enjoy going back to the issue regularly to read essential, yet marginalized, voices. The latest issue of Poetry International is out, with some of the finest writing I’ve read all year. Among much talent is a little poem I wrote last year called “Please Don’t Center Poems.” If you want to subscribe, and get that issue of damn near 600 pages, it’s out! This poem will come around again, in a tiny tiny chapbook soon, and I’ll be sure to let you know all about it when it does. New Poem from a New Manuscript in the Coachella Review! Just in time for the end of a difficult year, here’s a new poem in The Coachella Review! “Canticles Known By Heart” in Cobalt! A poem called “Canticles Known by Heart” was in an issue of Cobalt Review from last Spring, and I totally forgot to tell you about it! Please, forgive me, and enjoy the entire issues by clicking right here. There are three poems up at Across the Margin. If we’re allowed to dig out own work a bit, I don’t mind saying that “Feast” and “Barking Spiders” are two of my favorites of the work I’ve done in the last few years. I hope you enjoy them, too. Interview at TCR’s The Volga! The good people at The Cossack Review asked me some questions, and I did my best to give them answers–and a photograph with my chickens. You can scratch around the whole thing by following this link. There’s a new issues of The Cossack Review, and you can find everyone who’s in it, and how to order a copy over at their website. There’s also a rumor that there will be contributor interviews up there pretty soon, over at The Volga, their blog (which already has some excellent content). You can read a sample of the right here. Interview at Best American Poetry! In addition to writing poems, I also put out books from others through Cooper Dillon Books. The good people over at the Best American Poetry blog asked us a few questions, and you can read the entire interview right here! Among the 96 pages of action in the latest Carbon Culture Review is a poem called “Acts.” I hope you enjoy it, and pick up a copy to check out some of the graphic work they’re pairing with the literary goodness! I cranked out this little sonnet for my students, and thought this would be a good place to share it. If you teach, and would like to use it, go for it! Just please let me know. which is natural and easy on eyes. on a perch, together and warm, left left. to pass through, avoiding the swept clean curbs.
. to play with the spacing a little bit. who makes it home, safely, or moves way out. Note: the periods at the beginning of the lines in the last stanza are only to get the spacing to show up on here on WordPress. Look for two poems in the latest Ping Pong. This issue also features a folio of poems from Central America: lots of work I’m excited to read! Details for ordering and subscribing at here. It’s an honor to be included in the latest Carbon Culture: The intersection of Technology + Literature + Art. To read “Public Radio” and “Bird Rock Avenue,” just click right here! An additional poem, “Acts” made its way into the print edition, mentioned in a separate post. “Shaving is Too Easy” in Luna Luna Magazine! I hope you enjoy this poem, “Shaving is Too Easy,” in Luna Luna Magazine. The poem is in a manuscript that is hopefully forthcoming from some wonderful press, one of these days. Issue 14 of Storyscape Literary Journal has three of my poems in it, all in the Truth section. Also, check out the “Records” section for video of me reading poems, if that’s what you’re into. I recorded a poem called “Pre-War,” originally published in InDigest, into a microphone I made out of a Foster’s can, a 27mm piezo, a 1/4″ jack, an old Academy of American Poets membership card, and some painters’ tape. You can listen to it over at H_NGM_N, and I hope you like it. A Sharp Piece of Awesome! If you come across A Sharp Piece of Awesome out of Taft College, I hope you enjoy a poem I have in there called “On a Morning of Resolve.” The design work from James Meetze is pretty wonderful, and the cover art by Kerry Hyatt makes it look very good! The Barnstorm Literary Journal out of the University of New Hampshire has posted “Lightning in the Desert,” complete with an audio recording! I hope you enjoy this poem, “Stanzas from Home,” in TYPO Mag! And a huge Thank You to Adam Clay for allowing it to be there. If you see him around, consider buying him a drink. The Arsenic Lobster 2014 is out! It looks like my poem from Arsenic Lobster made it into the 2014 Anthology, which you can purchase right here! The good people at Crossroads: A Literary Journal of Ebb & Flow asked a few questions about poems and books. If you want to the answers, the interview is right here! The good people at Poetry International also posted it up over here. I hope you enjoy Carry On, a small collection of poems put out from H_NGM_N Books! There’s a new poem in Crannog #36, a wonderful magazine out of Galway, Ireland. They also make it available on Kindle, if that’s how you roll. I love InDigest, and they liked these two poems. Here’s a poem from Prick of the Spindle, Vol. 8.1, for Xavier Robinson, and I hope he’s alright. Here’s a poem in Hawai’i Pacific Review. I hope you like it. I hope you enjoy two poems from August 2013’s Caldera Culture Review. Hopefully it won’t be long before this space gets filled with poems. In the meantime, I’m in the shop over at CooperDillon.com, teaching over at Grossmont College, and am generally around town at AleSmith and the Non-Standard Reading Series.